This small property, nestled in the village of Soussans just north of Margaux, enjoys the pedigree of its neighbor, Chateau Palmer, at a fraction of the price. The estate dates back to 1730 when a Parisian lawyer working for Palmer acquired the vineyard and built the manor. The Sorge family took over in 1928, and in 2008 they made a supple wine, typical of the clay gravel terroir, with plenty of blackcurrant fruit and finesse. The 2009 vintage provided this Cru Bourgeois with even richer, more dense flavors. Aged 15 months in barrel, one-third new. 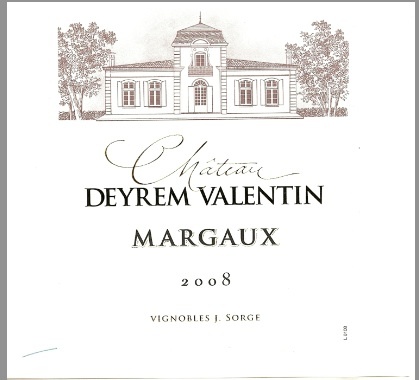 Chateau Deyrem Valentin Margaux, 2010…..
Winemaker: Christelle Sorge, 4th generation family wine-grower, and her father Jean Sorge. Vineyard/Varietal: 13h planted to equal parts Cabernet Sauvignon & Merlot with a few rows of Petit Verdot and Carmenere.